Competitive eating is not an activity people enjoy watching or participating in. Regardless of this, however, people like Matt Stonie, Joey Chestnut, Takeru Kobayashi, Dominic “The Doginator” Cardo are already well-versed in the ‘weird’ activity and have won several awards for their courage. A popular YouTuber and competitive eater, Stonie’s original plan was to become a dietitian, however, things changed and he eventually found love in devouring large quantities of food in a short time period. Get to know him more in this article. The competitive eater was born on May 24, 1992, in San Jose California, in the United States of America. By reason of his birth in the US, Stonie is of American nationality. However, the star is of Lithuanian, Czechoslovakian, and Japanese, ancestry. After his birth, he was named Matthew Kai Stonie but he decided to adopt the name ‘Matt Stonie’ as his professional name after he found fame. The YouTuber had his high school education at the renowned Evergreen Valley High School which is located in the Evergreen area of San Jose, California. After completing his high school education, Stonie moved to Mission College, which is located in Santa Clara, California to further his education. He spent about four years studying nutrition in the community college, after which he graduated with good grades. Nicknamed “Megatoad”, the American competitive eater recorded his first win in a lobster roll eating competition which took place in Hampton Beach, New Hampshire, in 2010 and later made his Major League Eating debut the following year at the Stockton Deep Fried Asparagus Championship in Stockton, California. 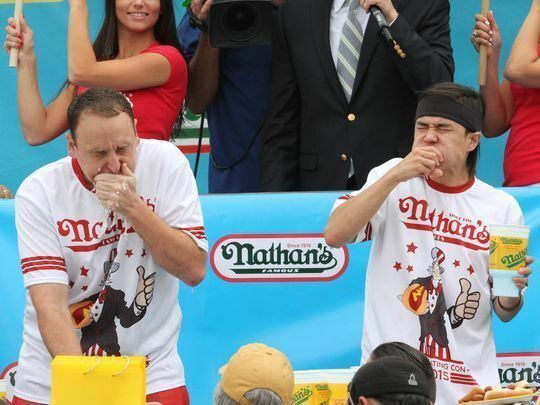 Matt Stonie’s career stepped to the next level in 2015 when he won Nathan’s Hot Dog Eating Contes and triumphed over 8-time defending champion/renowned competitive eating king, Joey Chestnut. He downed 62 hot dogs at the contest while Chestnut only devoured 60. Sadly, he failed to retain the title the following year after suffering a defeat at the contest. He came second after eating 53 hot dogs while Joey claimed the title that year after downing 70 hot dogs. On July 4, 2017, the San Jose-born star came in third, eating 48 hot dogs, behind Chestnut’s 72 and Carmen Cincotti’s 60. Matt Stonie’s eating talent is legendary and so too are the world records he holds. Between 2013 and this time, the competitive eater has gained outstanding world eating records. In 2013, he set three impressive records (Birthday Cake: 5.5 lb / 9 minutes, Frozen Yogurt: 10.5 lb / 6 Minutes, and Kookamonga Burger: 7.5 lb/ 4 minutes, 43 seconds) while in 2014, 2015, and 2016, he set six, nine, two world records respectively. Currently, Stonie holds the record as the number four ranked competitive eater in Major League Eating as well as the youngest member of the Major League Eating organization, which was founded in 1997 and headquartered in New York City. As regards his YouTube business, Matt Stonie is doing great in that area as well. His channel features many eating challenges. His first video, which captured finishing a gallon of Gatorade in 37 seconds, went viral on August 27, 2012. One of his most notable videos is a recording where he downed 25 McDonald’s Big Mac sandwiches in twenty-two minutes. He shared the video on September 24, 2015, and to date, the video still pulls an overwhelming number of YouTubers to his channel. Currently, his channel has more than 6 million subscribers while his most viewed YouTube video, as of April 2018, has over 25 million views. Some of his videos have also been featured on popular websites owned by notable celebrities such as Waka Flocka Flame, Bam Margera, Cheech & Chong. Now, you know one of the reasons Matt enjoys a huge followership online. Matt Stonie is one fast-rising celebrity to watch out for. He may not be your favorite YouTuber or competitive eater but he sure has a lot of followers who patronize his online business. So far, his YouTube business and competitive eating career have earned him assets valued at $700 thousand. Being a phenomenal eater and YouTuber, there’s no doubt this net worth will grow if he continues to work hard. MegaToad is the son of Cathy Stonie (mother) and Dorian Stonie (father), who are also parents to his younger brother called Morgan Stonie. Morgan helps out his elder brother with his YouTube business; he is Matt’s official cameraman and he is very good at it. At the time of writing, not much information can be accessed their parents but it appears they are supportive of their son’s respective careers. The question of the identity of Stonie’s girlfriend has been begging for answers ever since he found fame. After a thorough research, we can confirm that the YouTuber is only in love with his online and eating careers. He has no documented dating history neither is he dating any lady at the moment. Apparently, the only thing that matters to him, for now, is how to grow his career to a higher level. See Also: Kevin Sorbo Biography, Wife, Net Worth, How Tall Is He? Matt Stonie may have a big appetite for food but he has an amazing body mass that befits his height of 1.73 meters (5 feet 8 inches). As listed online, the competitive eater weighs 59 kilograms, which is 130 pounds.